Fun With Food by Lynne White Cookbook 20th Century Fun With Food by Lynne White Cookbook 20th Century is a cookbook of recipes by Lynne White using Marshmallow Fluff. No other publishing information or date. Nice softbound booklet with 31 pages. Cover shows picture of chocolate cake with white frosting along with other goodies. Back cover shows jar of Marshmallow Fluff with baked goodies in the back ground. Inside front cover shows Marshmallow Fluff factory in Massachusetts. This cookbook appears to have not been used. We consider it to be in excellent condition. It measures approximately 6 3/4 x 4 1/2 inches wide. 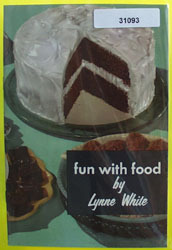 Items Similar To "Fun With Food by Lynne White Cookbook 20th Century"